Are you guys ready for a story? This one is actually not so bad. A couple days ago I post on Facebook if anyone happened to have a spare PCI/PCIe Network Interface Card (NIC), since it was going to be used for interest access I was ok with it being 100, but was aiming for 1000 (now that Shaw provide over 300mbps internet, clearly 100 doesn’t cut it). well, well, not even dusty, a PCI NIC, exactly what I needed in my hypervisor to play with OPNsense. 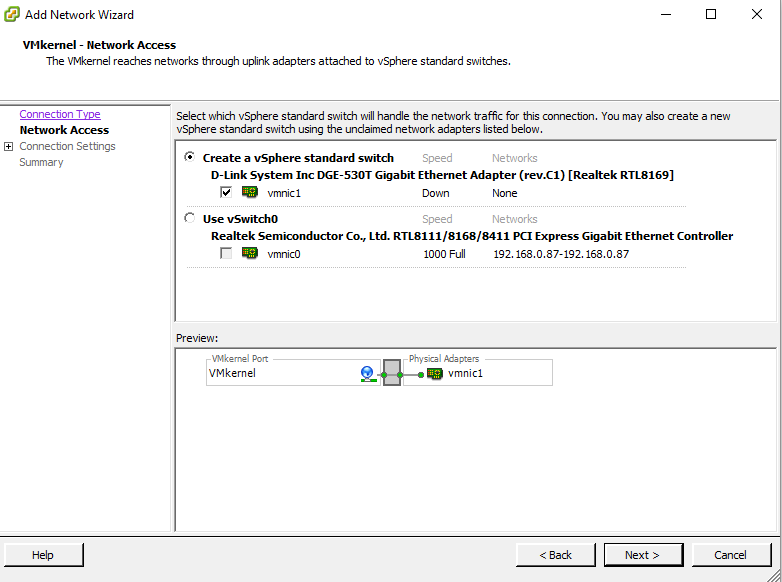 I originally was going to try layer 2 trunking via VLANs, however the main vSwitch already had VMkernel Nics bound to the physical adapter @ layer 3, and the same interface on my firewall (Palo Alto) wouldn’t allow me to create a layer 2 sub-interface is the main interface was already bound to layer 3. Since I wanted my OPNsense VM to get an actual public IP address, this required my device to get a connection from my VM, directly to my modem at layer 2… yeah another NIC. So here we are, and it didn’t take long for me to shut down my VMs and install the card, and boot my hypervisor back up (I hope to one day have multiple hypervisor to not have to shut down my VMs, but even then, if you don’t pay chances are you won’t get access to the APIs that migrate the memory states of the VMs for you, so it’s a hassle either way…. anyway back to the story. Oh Borat, who brought you in?!?! So as you may have guessed I went to add a new vSwitch for my new VM to get it’s direct Public IP, and to my dismay there was no physical NIC to pick… what the…. You can probably guess where the official answer went, but I’ll enlighten you as I did follow along for … pain? OK I don’t know why I did, I was really hopeful it wasn’t going to be the answer I knew it was going to be…. Hey! some of the command they provided helped, or did they? All this was, was some BS data chasing to tell you, IT’s Not supported, SOWWY! Clearly, there must be some answers by the community forums right?? So what do we get… One… unanswered and crying about a badly referenced link to source two... also unanswered crying about the same stuff we already know…. it’s officially not supported. 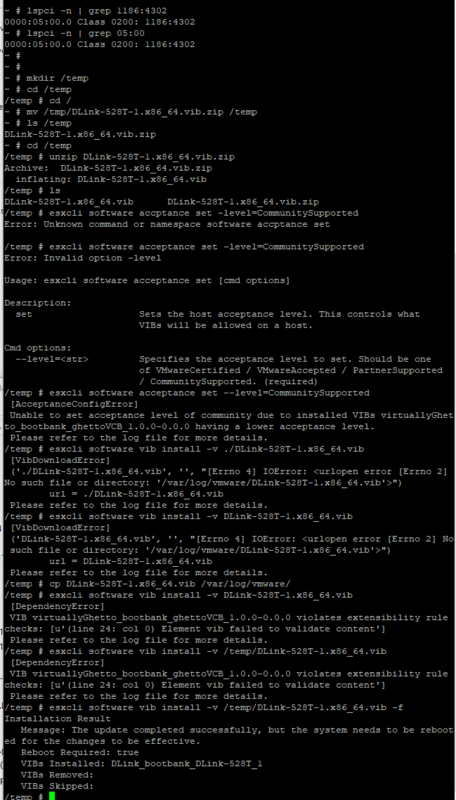 Well I’m running ESXi 5.5 Free and using GhettoVCB’s scripts, also unsupported, so not really an issue… the issue is teh lack of help right now. Yes believe it or not it is the power of the real untethered, unfiltered beauty that is blogging that we actually get some meat and potatoes. My first source showed signs of light! One problem, it’s literally 9 years old and using ESXi 4. OK well it also wanted a fair amount of direct file placing and special manipulation. Most of this works fairly differently in ESXi 5.x, and vibs or precompiled binaries that work with esxcli are the more preferred method. I avoid saying supported here, cause I use these methods to install unsupported packages :D.
Host acceptance level changed to ‘CommunitySupported’. which finally gave me a driver install successful! I was having some issues initially so I decided to give my lil netbook a simple /24 IP and give my OPNsense a simple /24 IP just to validate the card wasn’t the issue, or the drivers I just installed. That’s good, and finally can we transmit?!?! Hey!!!! we have communication! 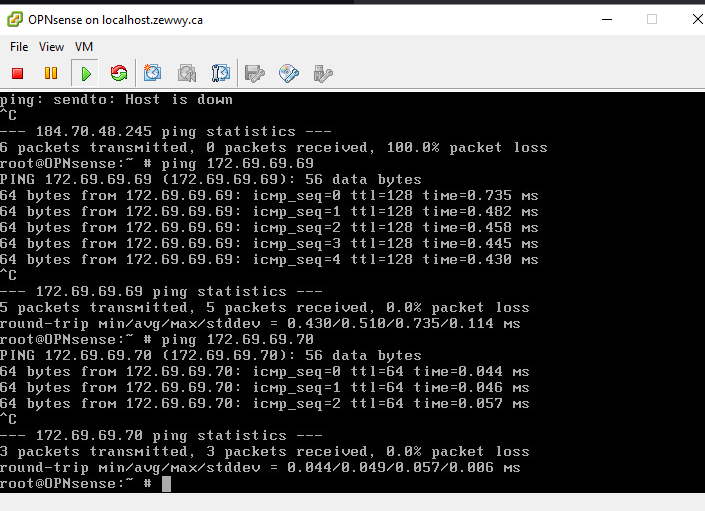 Now it’ll be figuring out getting the Public IP configured properly. But we’ll save that for another post. 😀 Cheers!